A Hamilton man has put a rare piece of New Zealand history up for sale on TradeMe. Glen Brady is auctioning what he claims to be a moa skull, which he says was discovered in the 1950s by his father who was working for a bridge building company in the Waitomo area. "They were digging the foundations for a bridge and they dug into the side of a cave and plucked the skull out," Brady said. The artefact was passed on to Brady after his dad passed away at the end of August. The skull has had 25,000 hits on TradeMe, but some users have criticised the listing, saying the skull should be given to a museum. "Some people were really, really nasty...I was really surprised at people's opinions on other people's property and what they do with it," he said. Brady has defended the auction and said museums keep most of their objects locked away. He said it is better to sell it in a private auction, where someone will get to see the skull. "Museums already have enough of these behind the scenes, for every one you see they probably have 100. "And I don't see the point in locking this away so nobody ever sees this again," he said. Wellington's Te Papa Museum said they have around 100 moa skulls which are used for scientific research as well as display. 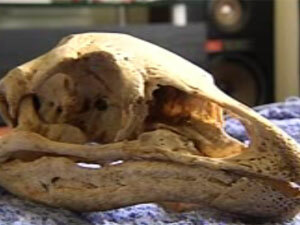 And Brady said a Te Papa expert has verified the authenticity of the extinct flightless bird's skull. Hunting is believed to have driven moa to extinction by about 1400 AD. The auction's starting price is $10,000 and while more than 2000 people have viewed the listing, so far no one has put in a bid.